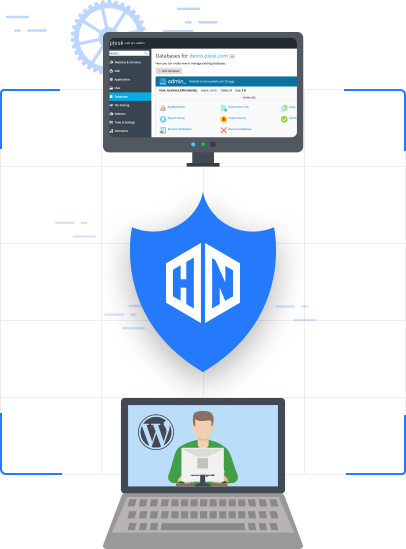 Experience the power of managed WordPress hosting on a shared hosting platform. All domains use LVE container techonology to isolate and guarantee resource and each domain's file system is caged to ensure security. Each container has 3gb memory and 3 CPU cores at its disposal. And servers are capped at 50 domains to ensure server stability. Domains are powered by NGINX with full page caching and optional Redis caching is available for no extra charge. Your domain is backed up every day to an external storage cluster and you can verify backup integrity and restore and download backed-up file from within PLESK. Imunify360 is a next-generation web server security solution. It filters bot traffic and provides total protection against ALL threats. Using machine learning the AI dynamically identifies threats and updates rules across the whole network in real-time. We only use top-grade SSD drives in redundant RAID 10 hot-swappable arrays for maximum performance. Our cloud infrastructure allows us to increase server resources on-the-fly without downtime. We use LVE containers to isolate all domains and guarantee their resources. Our TurboStack includes NGINX with full Page Caching and PHP 7 running under FPM. Redis and Cloudflare's Railgun are available for free and MariaDB powers the backend for unrivalled performance. Need help in moving from another host? We are happy to migrate all your sites to HostNexus. All you need to do is ask our friendly support team and give them some access details and we'll take care of the rest. This is one of our secret ingredients to keeping servers extremely stable. Unlike other hosts we don't load up a server with thousands of domains. In fact we employ a strict 50 domains per server policy. Choose a server location near you to speed up your site's load times and boost your local SEO rankings. We have managed WordPress hosting servers in the US, UK, Amsterdam, Singapore and Australia. Is your inbox overflowing with spam? All inboxes on our managed WordPress hosting platform are protected with the SpamExperts, the industry-leading commercial spam filter. Our SpamExperts spam filter also filters outbound email. This ensures compromised email accounts cannot send spam which often results in mail server IP blacklisting. We set insanely high resource limits for each domain. Each WP instance has 3gb memory and 3 CPU cores available ensuring peak performance. We also set PHP's limits on the high side to take advantage of the overall high resources available. Tuned for WordPress Our platform is tailor-made for WordPress. All WordPress instances get 3 CPU cores and 3GB memory. Automatically update your WordPress instance and plugins. Clone your site to a staging sub-domain and sync files or database tables back to your main site. Our in-built Security Toolkit will secure file and folder permissions among many other things. Manage your WordPress instance from the command-line with WP-CLI. No overloaded servers! All servers are capped at 50 domains. Ultra Secure Hosting We employ one of the most sophisticated security systems found on any Linux server in the world today. We couple this with a hardened security policy and the result is a web server with armored plating. Our servers are linked to the Imunify360 security network that is constantly assessing threat vectors. Once identified the AI distributes a new ruleset across the network. Imunify360 scans files on upload and automatically scans file systems for malware injection. Infected files are quarantined for later review. The advanced firewall integrates with mod_security and blocks unwelcome bot traffic. It is capable of defending against brute force and DOS attacks and port scans. Our container technology isolates each domain's file system. If malware does get in it is impossible for it to spread to other domains. We completely disable plain FTP connections. Uploads must be done with Secure FTP, often called FTPS/FTPES or TLS Explicit. This encrypts the password an FTP client sends to the server. In the unlikely event that your website gets hacked we will clean it up for free and provide a security review to track down the weakness in your site's codebase. Secure your site for free with Let's Encrypt SSL certificate. Our system auto-renews Let's Encrypt certificates and sends notifications if propblems with renewal are encountered. Overall server HTTPD monitoring is not enough to ensure excellent uptime. We also monitor the uptime on every individual website on our servers. What do we mean by "Real Websites"? If you select betaPRESS or or deltaPRESS you can host multiple domains. These are NOT your traditional Addon domains. Addon domains are a problem because they share the resources of the main domain. They are also a security risk as their file systems are not isolated from the main domain and other addon domains. When we say "Real Website" we mean that each of your domains gets the full 3gb and 3 CPU cores and do not share this resource limit. Each domain is set up on Plesk's subscription level meaning it has its own file system and is completely isolated and secure. Our TurboStack Performance Platform Accelerate your website's loading time with this incredible technology stack. We only use top-grade SSD drives in redundant RAID 10 hot-swappable arrays for maximum performance. Accelerate your site's performance with our built-in NGINX (fastcgi_cache) page caching. Railgun is a web proxy system built for Cloudflare that allows caching of dynamic content. PHP 7 outperforms all earlier versions of PHP by a huge margin. It also uses 75% less resources than PHP 5. Memcached is an in-memory key-value store for small chunks of data. It caches results of database calls, API calls, and page rendering. MariaDB is a drop-in replacement for MySQL. It is is radically faster than MySQL with more cutting-edge features. NGINX accelerates content delivery, improves security, and facilitates availability and scalability. Apache, the world's most loved web server, sits behind the NGINX reverse proxy. FPM is the highest performance handler for PHP. It is vastly superior to all other handlers. OpCache is a bytecode cache that stores compiled PHP code in-memory for faster access. Redis is an in-memory data structure store that caches database queries and ojects. HTTP/2 reduces latency and speeds up website delivery due to improved parallelization. Data Protection Your data is precious to us and we treat it accordingly with comprehensive backup policy. Our core backup system is powered by ClusterLogics and data is backed up to separate storage devices every day. The system is accessed via Plesk and clients can restore or download files and databases from multiple resore points. Our ClusterLogics system also includes a full DR (Disaster Recovery) platform. Backups can be converted into templates that can be used to build VMs - no lengthy BMR (Bare Metal Restore) needed! If we encounter server failure we can have it up and running within the hour. Every good backup policy should have multiple levels. Our clients can also perform Plesk-level backups to remote storage like DropBox or any FTP location. Spam-Free, Reliable Email Included Unlike other Managed WordPress hosts we offer a fully featured email service that is 99% spam-free and 100% clean from all blacklists. Reclaim control of your inbox! All inboxes are protected with the SpamExperts, the industry-leading commercial spam filter. Access your email from anywhere with an internet connection with Roundcube webmail. We do not limit the amount of mailboxes you can create. We do limit mailboxes to 1gb with larger mailboxes available on request. We support SMTP (sending mail with Outlook etc), POP3 (receiving mail) and IMAP (email on your mobile device). Easily create autoresponders in the Plesk control panel. Create unlimited email aliases and forward to internal and external mailboxes and create mailbox groups. "I am HostNexus customer for almost 5 yrs. Really they helped me out of box, sometime I need many suggestion they always reply me in couple of minutes...."
"Hostnexus has been true to their word when it comes to customer support and tech support. Being with Hostnexus for over a year I must say there is no other ...."
"From a Newbie to Nexology in 12 short months... and they said a grandmother couldn't do it. With the patient assistance, superb personal support and the ever...."
Submit support tickets, manage billing and invoices, read our knowledgebase and view server status. If you don't want to login to our support portal just email in your support requests and a ticket will be created. Our 24/7 technical support staff are available on Live Chat you require immediate assistance with any issue. We monitor the uptime on every individual website on our servers and react proactively to fix any issues.